Sign up and receive Property Email Alerts of Houses for sale in La Lucia, Umhlanga. Different and exciting, this exclusive and quite splendid, double volume property, is situated close to the beach at an excellent Ridge Road address in prestigious lower La Lucia. With impressive road appeal this 4 bedroom home is immaculate throughout and the large study and a prayer room could provide additional accommodation. The lower storey has baronial reception rooms, and a magnificent open plan kitchen with scullery and second fitted kitchen as well. Glass stack doors open off the formal dining and lounge area to a covered pool terrace and level private walled garden, with outdoor entertainment facilities and braai and serving area. Mediterranean security shutters adorn the windows and doors for additional glamour. The upper storey, accessed via a sweeping marble stairway, has a wide landing incorporating a pyjama lounge area, perfect for the children, four double bedrooms and a more private annexe with the study and prayer room. All bedrooms are en-suite and refurbished to the highest quality, and the master suite is enormous. Two large balconies, one off the main bedroom, face the ocean with sea views. A sophisticated CCTV security system with monitors on both levels, plus beams and electric fencing give immense peace of mind. There are automated gates and a broad paved driveway to a double garage and loads of additional secure parking. Staff accommodation and all features appropriate to a property of this calibre are evident. 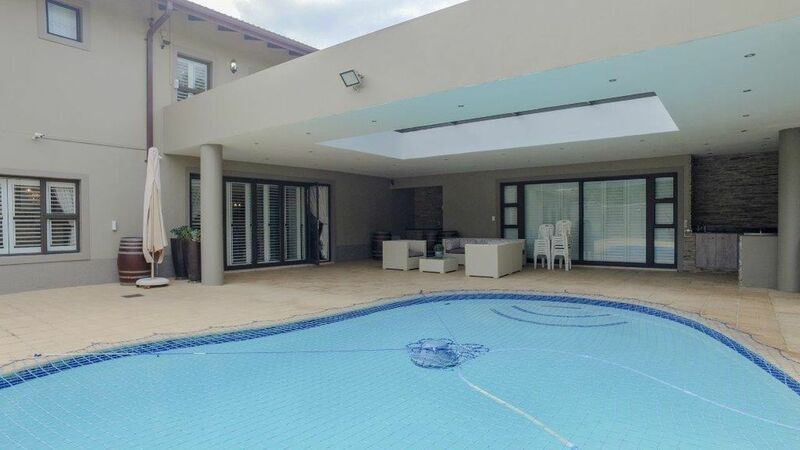 Sign-up and receive Property Email Alerts of Houses for sale in La Lucia, Umhlanga.